Only 15 minutes from Metter, the amazing George L. Smith State Park contains 1,634 acres of fishing, camping, boating, and hiking opportunities. Boats are available for rent, as are several cabins. A beautiful covered bridge sets the perfect scene for avid nature photographers as well. 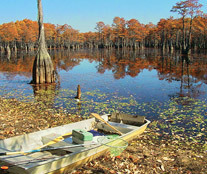 Mill Pond Kayak offers guided paddling tours of the 412-acre cypress-lined Watson Mill Pond inside the park. Beaver Creek Plantation has provided some of the finest quail hunting courses, guides, and trained dogs since 1998. As a members-only quail hunting plantation, Beaver Creek offers quality quail hunting as well as a cozy retreat for individuals and families, complete with a fully-stocked lake. Other offerings include dove shoots, pheasant tower shoots, boating and fishing, a pro shop, and mule and wagon rides. 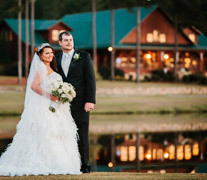 Weddings and special events can be scheduled here as well. is a college town that exudes history, architec- ture, live shows and museums, sports, nature and fun. 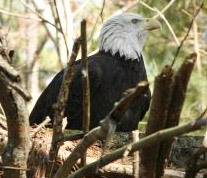 Meet a bald eagle at the Lamar Q. Ball Raptor Center, or spend at hot summer day at Splash in the ‘Boro water park. Gordonia Alatamaha State Park in southeast Georgia is a favorite for picnicking, family reunions and golf. 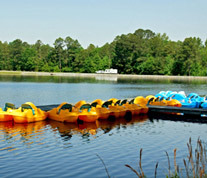 Visitors can rent pedal boats and fishing boats during warmer months. Docks are available for anglers. Experience Savannah, Georgia’s unique heritage and culture, which blends the best of the old and the new. 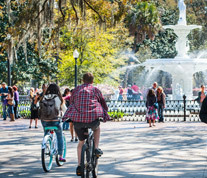 Explore beautiful park-like squares, stroll along River Street and City Market or spend an afternoon people-watching in Forsyth Park. You can even head to Savannah’s backyard beach at Tybee Island for a day of fun in the sand. 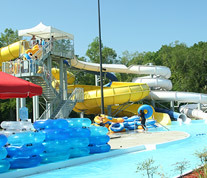 In Statesboro’s Mill Creek Park, enjoy more than 768,000 gallons of fun only minutes away from Interstate 16.